The beautiful Chamäleon Theatre echoes the traditional setting of an cabaret-style theatre. With individual dark oak tables and chairs, littered with candles and character. The theatre felt warm and welcoming yet utterly cosmopolitan. As we sat down we were then able to enjoy the show with drinks and succulent tapas that was delivered to our table. The show itself is titled Underart and is performed by the company Circus Cirkor. The production itself came from an interesting concept after one of the companies’ performers Olle Strandberg was temporarily paralysed from the neck down after a tragic accident that abruptly ended his career as an artist at the age of 21. During the International Scene of Contemporary Dance in Stockholm, he jumped in the air to do a triple somersault, lost control and landed straight on his head. Despite this horrific accident, Olle is now fully recovered and has been working as a director and creative project manager at Circus Cirkor since 2011. Underart is inspired by Olle’s accident, with the tagline An Ode To Crash Landing, it is a performance all about picking yourself up after falling down. It isn’t a show of revolving tricks, there are moments of stillness that bring it all back to the core message of the production. The production itself is a combination of original live music and thrilling acrobatics. The music, composed by Anna Ahnlund and Andreas Tengblad is mesmerising and fresh. It mixes contemporary sounds with soft vocals to soundtrack the visually stunning acrobatics on stage. With the combination of guitar, bass, violin, synthesisers, wood blocks and so much more, the sound created is colourful. Each movement is sharp and slick, whilst the performers are balanced upon each other, the audience are balanced on the edge of their seat. It’s a striking production that appears so effortless, as they perform completely unfazed. The balance of light and shade in performance is remarkable. Whilst there are joyous elements where the performers dance and move with expression, these are interjected with simple yet completely encapsulating stillness. There is a moment in which Alexander Dam jumps onto two thin and very tall pieces of wood that elevate him high up into the top of the stage. For many minutes he stands there, with the rest of the cast gazing up at him. It is encapsulating as he completely commands the stage with his focus. The bond between the cast members is evident on stage, as the level of trust between them is distinctive. They leap and fall into each other so naturally, which is what makes this production so beautiful. It is a representation of friendship, and how we build ourselves up again after we are knocked down. The performance is poetic, as they move with utmost precision – it is beautifully fragile. It’s artistically brilliant and reflects a high level of technique and style. 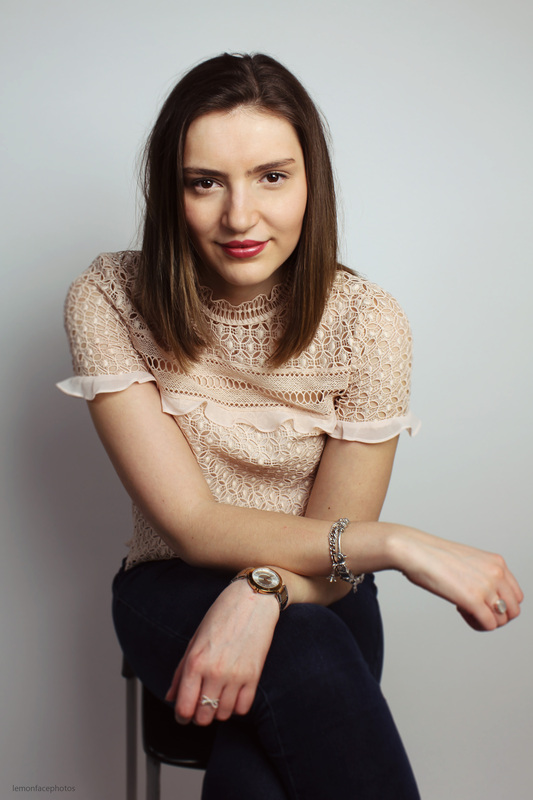 Confidently performed and organically created, it is a contemporary style of theatre that is innovative, visionary and moving. It’s a potent reflection of life and the challenges we face showcased through breathtaking acrobatics. 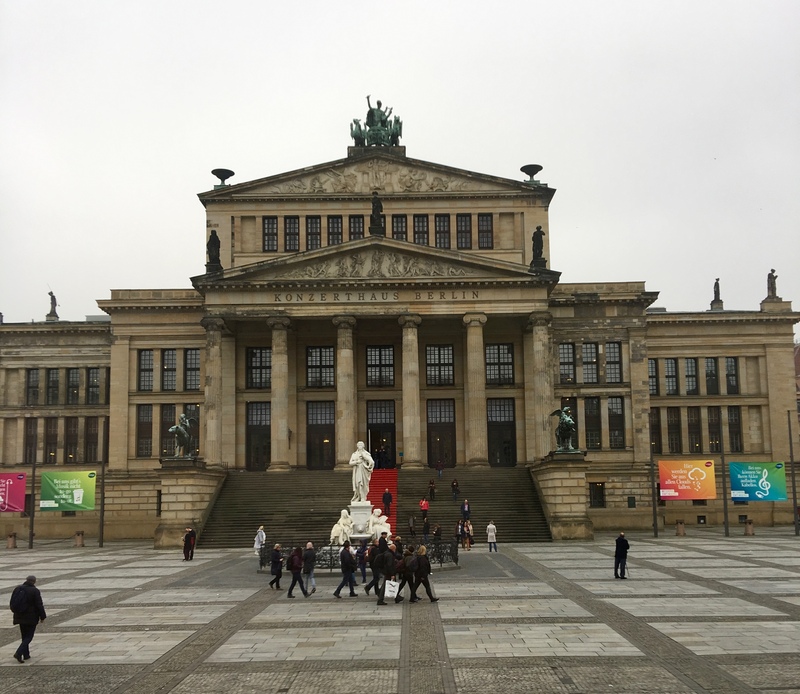 We were then taken on a walking tour of Berlin, and approached the Reichstag parliament building, which is an impressive mixture of both modern and traditional architecture. 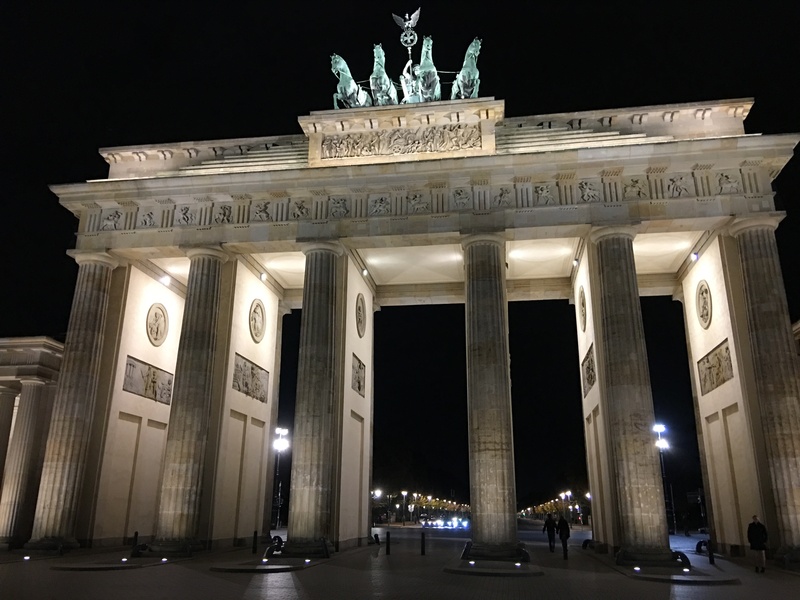 We were then led inside the Reichstag and went up to the Käfer restaurant where we were greeted with wine and a selection of German bread, before being treated to the three course meal. 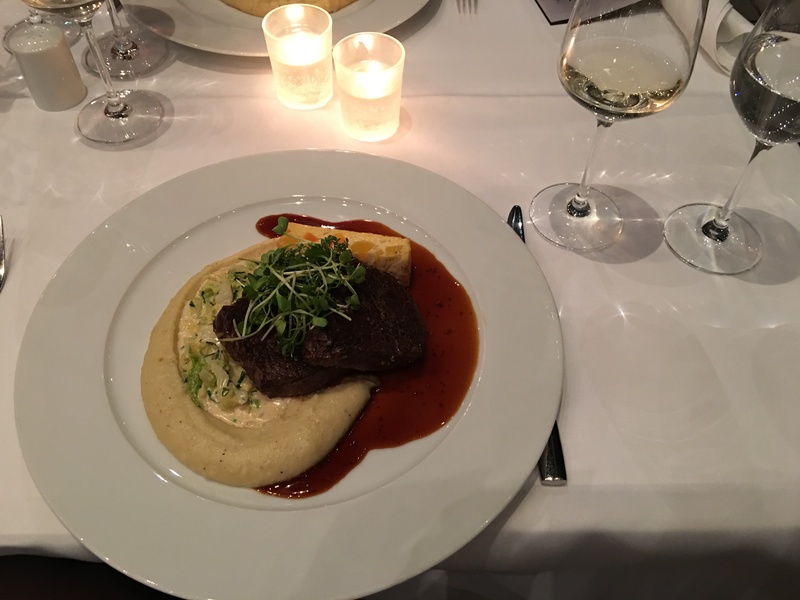 The dinner consisted of classic dishes that had a German twist. 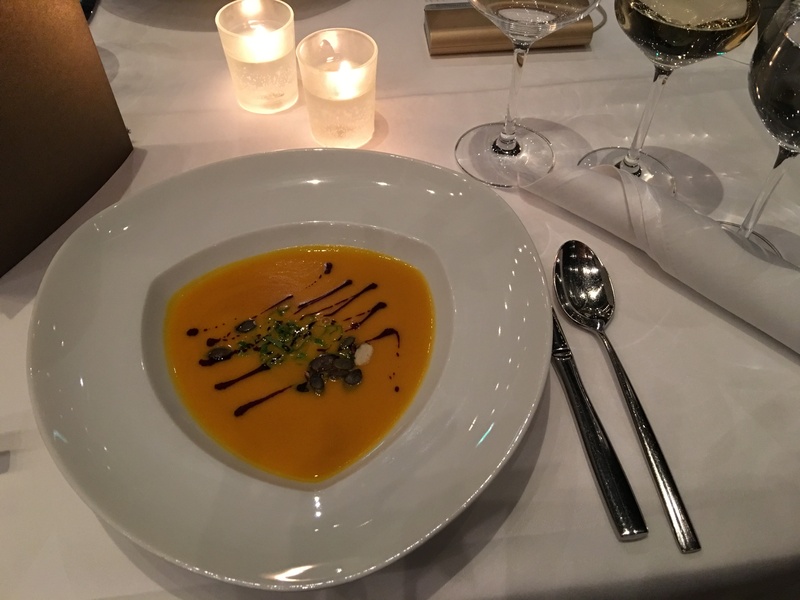 Our first course consisted of a warming hokkaido pumpkin soup – perfect for the crisp Berlin evening. This was then followed by a saddle of beef, accompanied by creamy savoy cabbage, carrot terrine, mashed potato and a dijon mustard sauce. All the flavours blended together excellently, and they complimented the tender beef well. 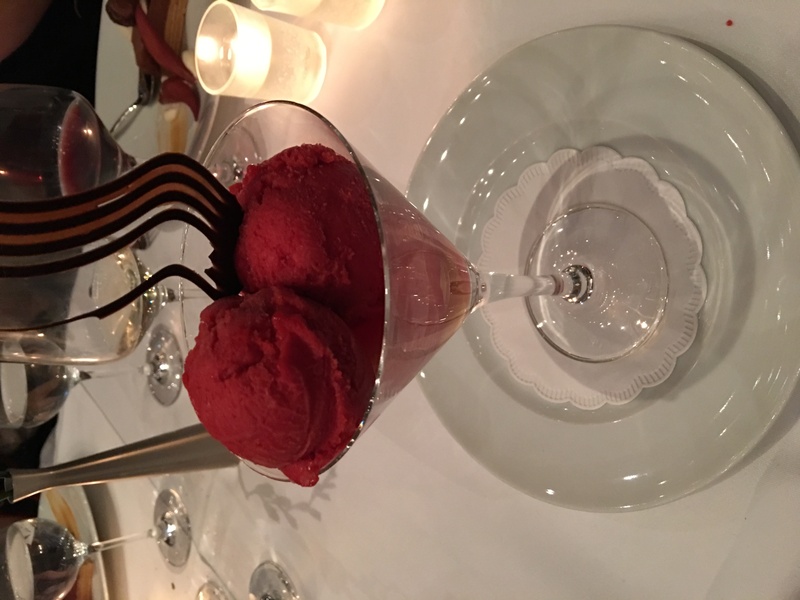 The meal then finished with a sweet sorbet, which was the nut-free alternative for me. I was highly impressed with their ability to cater for my nut allergy, which is something that I really struggle with abroad. The restaurant has a relaxed setting and exquisite atmosphere. 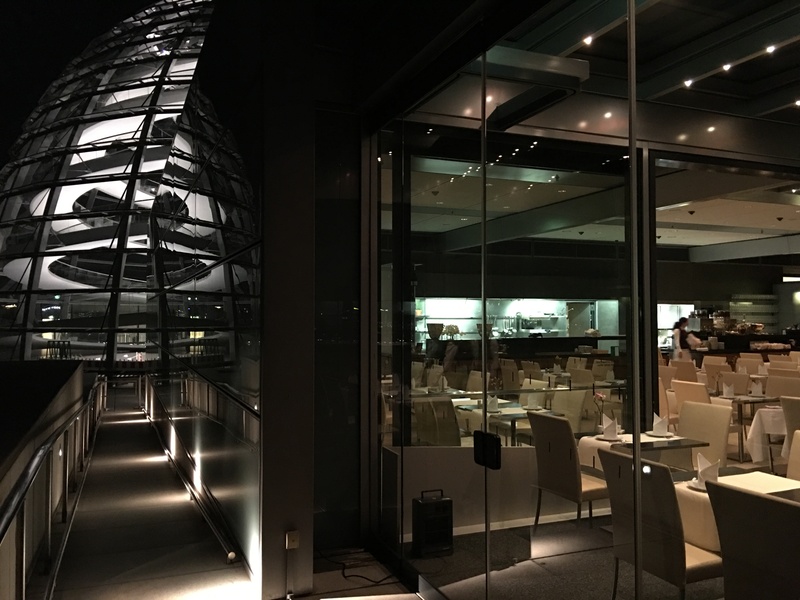 The simplistic design creates an ideal ambience as the glass windows surrounding us allowed us to dine overlooking the spectacular views of the city. 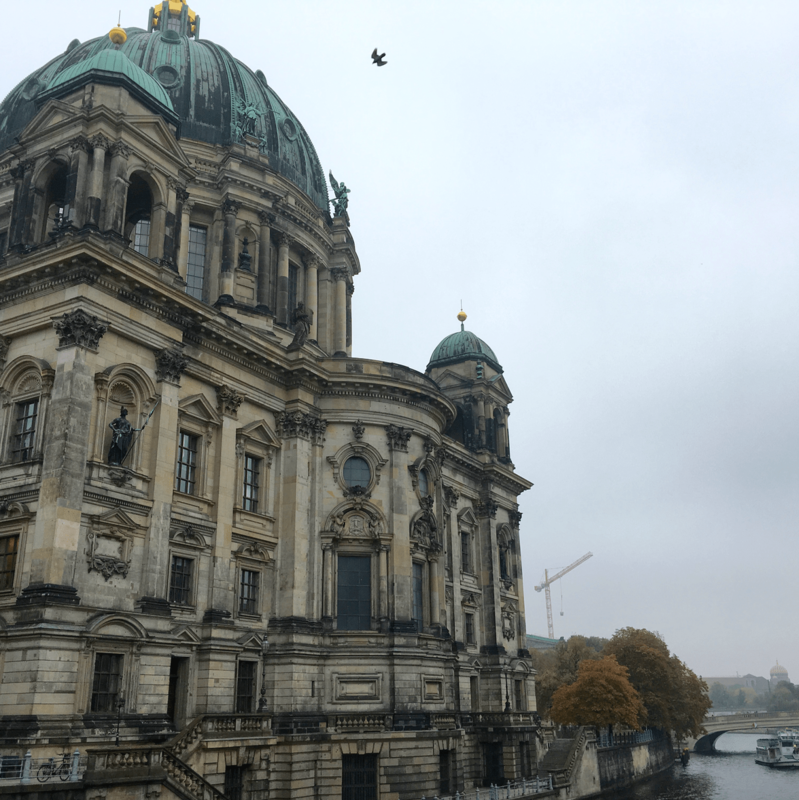 Despite the cold, we wandered out onto the balcony to have a proper look at Berlin. The city felt so serene from up there and it was incredible to see iconic German landmarks like the Brandenburg Gate, all lit up. Stuffed with food, we then went back to our hotel for a good nights sleep before a busy day of exploring the city. 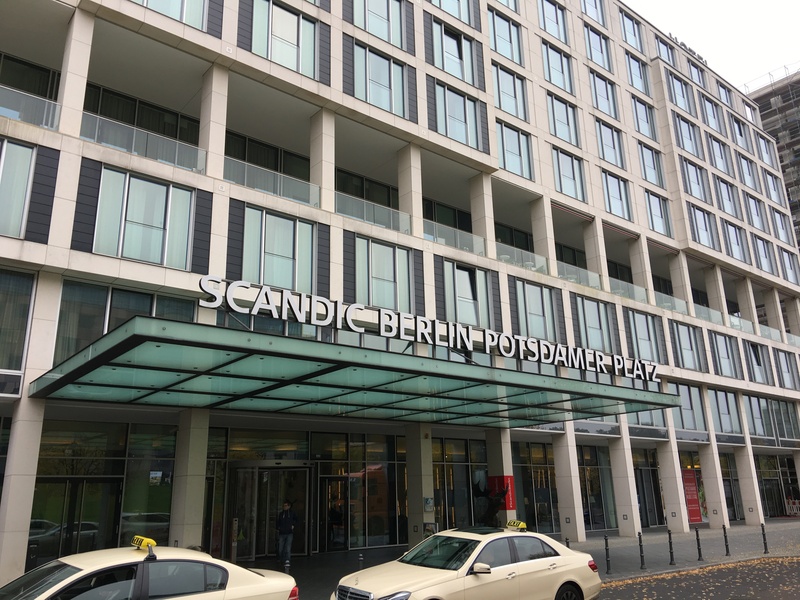 We stayed at the Scandic Berlin Potsdamer Platz hotel, which is located in the heart of the city. Designed with a Scandinavian theme, the hotel itself is ultra modern and thoroughly comfortable. My room was hugely spacious and very well lit. With the whole of the front wall being a window, it meant the room felt bright and warm. I was highly impressed with the rather large bed that allowed me to have the best nights sleep in a very long time. I did a complete room tour on my vlog here. The next morning I was invited down for breakfast with the other bloggers. The breakfast restaurant had a large layout and had an extensive amount of options. 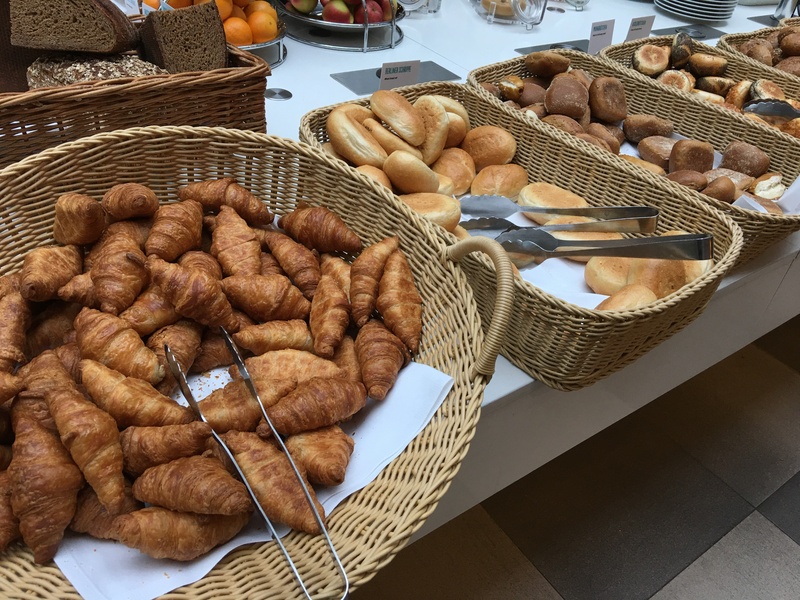 With a laid-back buffet style, it allowed you to help yourself to pastries and cooked breakfast – idea for filling up before a long day walking around the city. 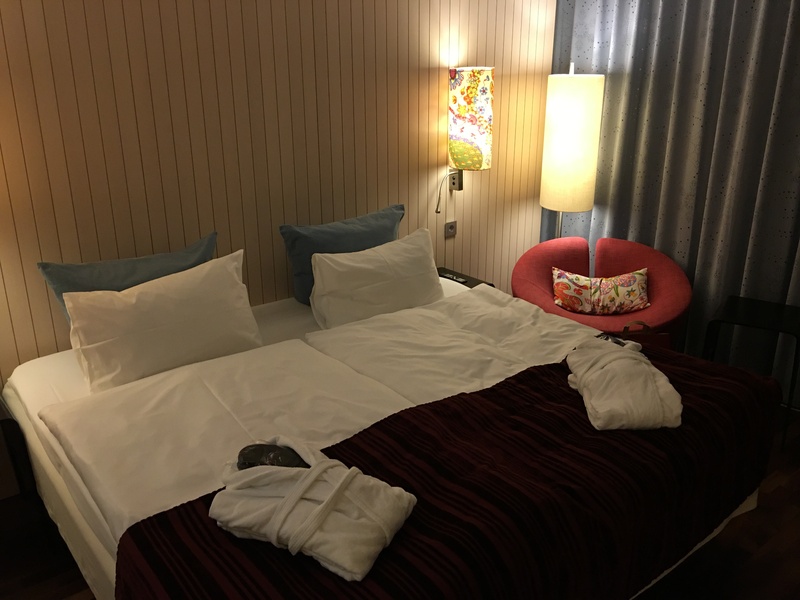 I had a whole day to fit the whole of Berlin into, and although my hotel room was so comfortable and I wanted to lie in that bed all day, I went exploring. After being unsure of where to start, I hopped on a bus tour and went around the city for a few hours. Once I’d got my bearings, I picked all the spots from the tour that I wanted to visit and went on my own walking tour. I discovered the culture of the city in the Jewish Quarter, and wandered around the main landmarks of the city and the tourist hot spots. 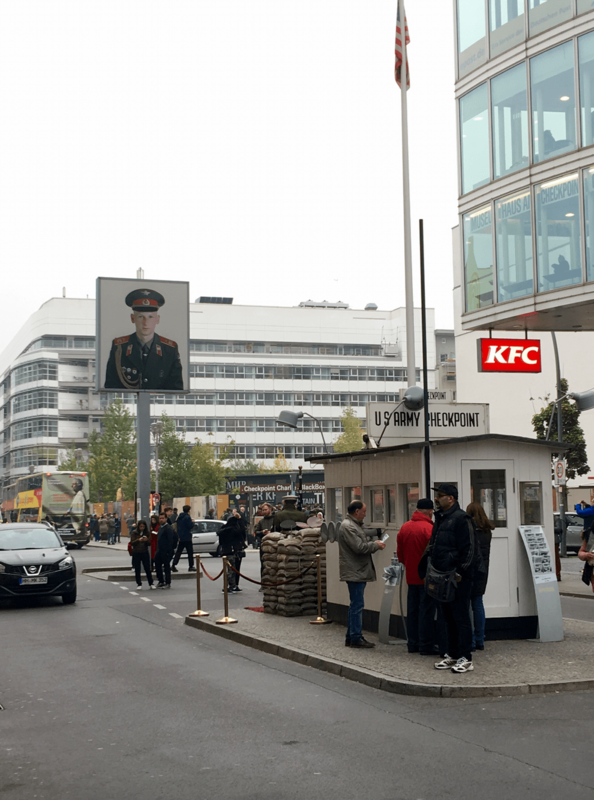 I saw the iconic Check Point Charlie, found where the nazis burnt the books at Bebelplatz and understood the poignancy of the Holocaust memorial. 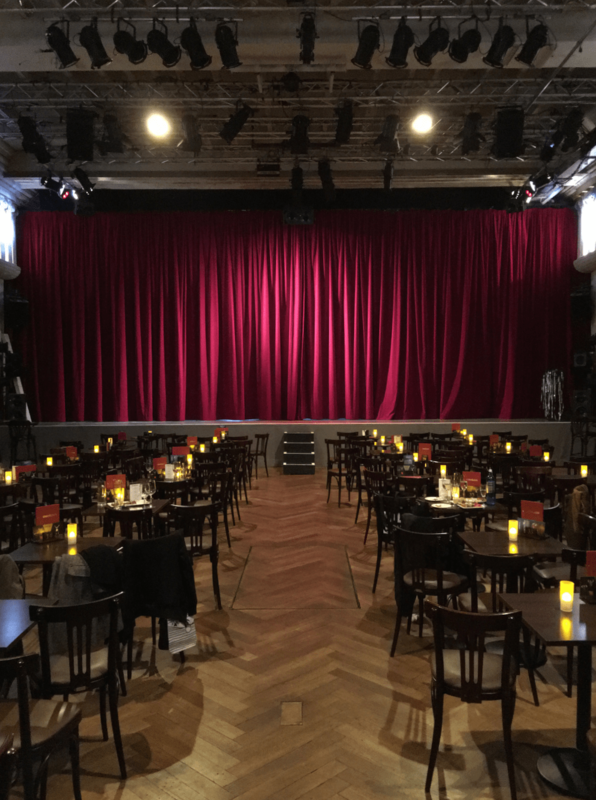 I uncovered the beauty of Berlin and delved into their theatre culture, which was a real eye-opener for me. 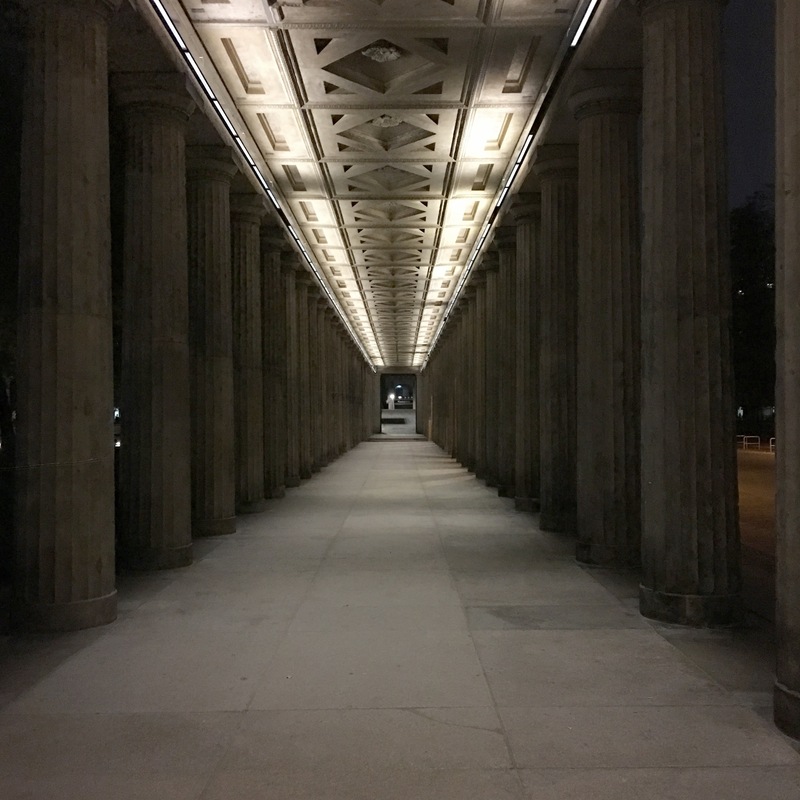 Berlin has so much to offer in regards to art, history and character.